The Pakistani Telecommunications Company Limited (PTCL) was privatized in 2005 and with Etsalat obtaining 26% shares along with management rights. Since then PTCL has shed more than 50,000 workers. 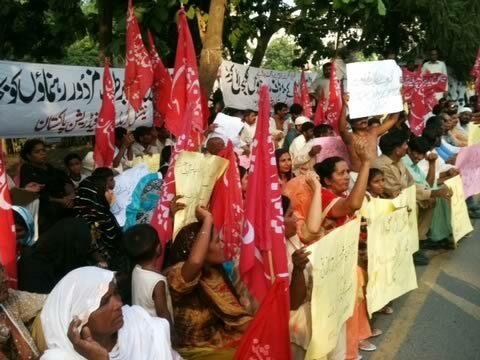 Last year, when workers organized a national protest to demand a wage increase, Etsalat suspended 600. Although most were subsequently reinstated, 83 leaders were terminated. 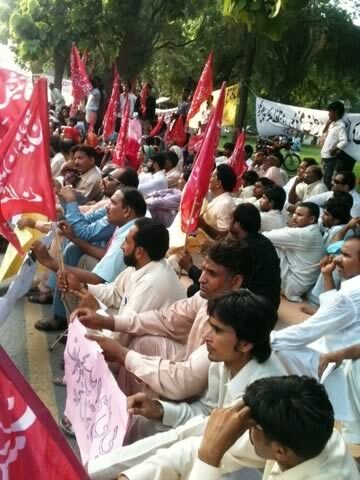 On the 1st of August PTCL workers set up a protest camp in Lahore to demand their reinstatement. On the 5th of August 400 trade unionists, half of them women, joined the camp in a show of solidarity and threatened to escalate their tactics. While currently sitting on a side road and not interfering with traffic, they are prepared to block traffic, picket the PTCL headquarters or even occupy the offices of the PTCL headquarters.